On the evening of Thursday, 10th December, the HKVCA held its annual Christmas Cocktail event at the elegant China Club. With close to 100 people in attendance, and drawing from all sectors of our industry, the party was an enormously festive and celebratory affair. George Chan, Managing Editor of SCMP.Com, delivered a most memorable and timely speech on the importance for tech start-ups, and indeed the entire investment industry, to incorporate a philanthropic mission as part of its business strategy. "Is it just about making money, getting higher returns for your investors, or getting your portfolio companies to launch their IPOs as quickly as possible? ", Chan asked the audience. While acknowledging that private equity and venture capital funds are not "charity organizations", and indeed must make money if they hope to stay competitive, he added: "But if you want to make a difference, then you need to think about what your mission is." Chan then went on to challenge the industry by suggesting: "[T]he next time you sign a deal, pause to consider what kind of impact you and your business partners can have to make the world a better place, and what your real mission and purpose is or should be." We would like to extend our special thanks to George Chan for his wise and valuable words. We would also like to thank our Venture Committee for being the lead organizing committee for the event and our cocktail sponsors, Suzanne Callister from Alter Domus and Simon Mak from Ascent Partners. Last but not least, the HKVCA would like to thank most sincerely all the participants who helped to make this event a most remarkable evening. Please click here for George's article. HKVCA held another successful weekly luncheon talk on 3 December 2015. Velisarios Kattoulas, Chief Executive Officer, and Alastair Campbell, Director of The Poseidon Group, discussed the impact of the economic slowdown in China on emerging markets politically and economically. Held at the China Club, all available seating was fully occupied and attendees enjoyed the relaxing and interactive atmosphere. A brownbag luncheon talk with speakers from Ernst & Young was held on 30 November 2015 at EY's Hong Kong offices. The talk was on the topic "Nine Months after Announcement 7: Sharing War Stories and the Markets' Response" and the speakers shared their experiences dealing with Announcement 7 reporting and tax filing, and highlighted a number of new supplementary regulations. They also discussed with 46 participants how Announcement 7 is impacting the transaction environment and practices. We would like to express our thanks to our extremely knowledgeable speakers and offer special thanks to our sponsor, Ernst & Young, whose support made the event possible. Another successful HKVCA wine tasting evening, our 15th such event in 2015, was held on 23rd November at the Hong Kong Club. The event's theme - "all roads lead to Rome Tuscany!" - proved most popular, attracting a lot of professionals. Our Master of Wine, Debra Meiburg, took the audience on an informative and entertaining journey offering a fabulous selection of Italian wines. The evening was great fun and the Association received a lot of positive feedback from those in attendance. We would like to thank our organizing committee, especially Marcus Thompson, Alain Fontaine and Anthony Chan, and, for being part of another very successful event. And of course our special thanks goes to our sponsors, Alter Domus and Clifford Chance, without whose support the event would not have been possible. The HKVCA annual Charity Fundraising Beer Pong Competition, organized by the Young Professionals Committee, was held on November 20, 2015 at the sensational Deja Vu bar in Lan Kwai Fong. Sixteen teams entered the competition, with the team from AlpInvest emerging as the overall winner while the team representing Citi were runners-up. We The evening proved to be a tremendous success with HK$18,000 (ex-costs) fundraised for the Volunteers for Seniors Day program (by HOPE Worldwide). The program works with a number of different community partners and volunteers who visit thousands of single, elderly persons each year living in publick housing estates. The elderly are given packages containing various necessities and the visitors help them tidying their homes. The HKVCA would hereby like to thank more than 100 participants who helped turn this very special event into an evening to remember. The HKVCA hosted a luncheon talk on Monday, 16 November discussing the importance of due diligence from the financial perspective and how effective due diligence can help mitigate risk and promote value creation. Held at the China Club, the lunch attracted over 60 HKVCA members. We would like to thank Blackpeak (HK) Ltd for their sponsorship and for hosting this important topic. During the talk, Jack Clode, Partner at Blackpeak (HK) Ltd, Sean Chen, Director and Head of the Beijing Office, Tom Pellman and Roger Du, Senior Associates, addressed the integrity due diligence process and presented a case study highlighting the way due diligence is often conducted in China, with practical tips for analysis. Our monthly breakfast meeting, held at the Hong Kong Club on Friday, 6 November, was once again oversubscribed with more than 70 members in attendance. This successful monthly event would not have been possible without the sponsorship of FTI Consulting to whom we would like to extend our thanks for helping make this great networking event possible for our members. On 26th October, Jie Gong from Pantheon Ventures (HK) and Malcom Prebble from KPMG China delivered a masterclass to an audience of more than 50 HKVCA members on how private equity fits into the financial industry ecosystem and the tax implications around PE funds. They were joined by Josh Jacob from Hamilton Lane and Kallan Resnick of the Park Hill Group who discussed the LP universe and the issues and opportunities for fund raising within in the industry. The class left attendees with a series of key takeaways, including how to identify the core drivers of value creation in private equity and the benefits and challenges of being a limited partner. We would like to thank KPMG for its sponsorship of this successful and most noteworthy event. The HKVCA’s LP Committee hosted the latest in a series of LP only luncheons where one of 2015’s hottest topics in Chinese private equity was discussed - the delisting of technology companies from US stock exchanges and their relisting on the Hong Kong or a mainland stock exchange. The Committee was delighted that as many as 23 representatives from 20 limited partner institutions were able to take the time from their busy schedules to attend the lunch at the China Club. The HKVCA’s Private Equity Fundamentals Course, our comprehensive training course designed for those seeking to enhance their knowledge of the core fundamentals of private equity and venture capital, was held this year between September 25 and October 16. The last day of the course, which covered case studies involving Pacific Coffee and Hong Kong Broadband Network, was completed on October 16 and attracted over 50 participants. Both case studies were conducted in a group discussion format with lively participation from our attendees. We would like to extend a special thank you to our speakers, Oscar Chow from Chevalier Group; Roger King and Winnie Peng from HKUST; Alvin Lam from CVC Capital Partners; and NiQ Lai from Hong Kong Broadband Network. The HKVCA’s Private Equity Fundamentals Course is a comprehensive training course designed for those wishing to enhance their knowledge of the core fundamentals of private equity and venture capital. Held annually, it also serves to refresh and upgrade the skill set of professionals in the industry. Modules are led by highly experienced industry practitioners with years of experience in deal-making, structuring, corporate value-creation and exits, often utilizing real cases as a way to illustrate and share their professional insights. For this year’s course we were especially pleased to have the support of the Hong Kong Stock Exchange, Hong Kong University’s MBA program, as well as the MBA program at the Hong Kong University of Science and Technology. Patrick Yip of Deloitte, who discussed complex tax issues. The HKVCA Family Office lunch was held for the first time in October to provide a platform for the various family offices to meet and interact in an informal setting. Attendees were able to re-connecting with old friends and indeed make new ones. With 16 family office professionals joining us at the China Club, we received excellent feedback from those in attendance and a number of constructive suggestions as to how the HKVCA can best serve this important segment of the profession. Our monthly breakfast meeting on 9th October, 2015, held at the Hong Kong Club, proved to be hugely popular with almost 70 people in attendance. As always we would like to express our sincerest gratitude to our members and our guests for their continued support, without whom the networking event would not have been such a success. Our very special thanks as well to our invaluable sponsor Poseidon, whose contribution made this event possible. An HKVCA Luncheon talk, titled “Regulatory Update: Implementation of AIFMD and FATCA”, was held on 18th September, 2015 at the China Club. Mark Shipman, Partner at Clifford Chance, and Angelica Kwan, Partner of US Tax at PricewaterhouseCoopers, delivered the talk together, discussing the latest trends in AIFMD marketing and FATCA. With more than forty professionals attending,we would like to express our thanks to our exciting speakers and a special thanks to our sponsor, International Private Equity Market. Our monthly breakfast meeting, which continues to prove extremely popular, was held at the Hong Kong Club on September 11, 2015. With almost 70 people in attendance, we would like to express our appreciation to our HKVCA members for their continuing support and also to the many guests in attendance. We would of course like to especially thank our sponsor, FTI Consulting, who made this great networking event possible. On August 21, 2015, with more than 60 members in attendance at the China Club, the HKVCA’s 28th AGM elected 24 board members. We would like to thank all our valuable members for their continuous support of the Association during the past year. The HKVCA-IRD Training Course is a comprehensive and intensive training program that has been specially designed for professionals working at the Inland Revenue Department (IRD). The goal of the course is to provide these professionals with greater insight into and a more significant understanding of the fundamental principles involved in the private equity and venture capital industry. We would like to thank our speakers, John Levack, Vice Chairman of the HKVCA, and Puay Khoon Lee, Director of PwC, for their invaluable contribution and support. The always popular Young Professional Mixer was held on July 16, 2015 at Racks MDB in Lan Kwai Fong. This regular networking event, which is aimed specifically at our younger professionals, attracted over 60 participants from the private equity and venture capital industries. An HKVCA Luncheon talk, titled “Hong Kong Broadband Network – From MBO to IPO in < 3 Years”, was held on 15th June, 2015 at the China Club . Alvin Lam, Senior Managing Director from CVC Capital Partners, and LAI Ni Quiaque (NiQ), Head of Talent Engagement and Chief Financial Officer from Hong Kong Broadband Network, together delivered an inspiring talk that included discussion of how the resources of a global private equity firm were able to leverage that of an IPO engagement from the day after MBO. Sixty professionals representing the private equity and venture capital industries attended the popular event. Last but not least, we would like to extend our thanks to sponsor, Freshfields Bruckhaus Deringer, for making this event possible and successful. A luncheon workshop was held on June 12, 2015 focusing on the topic of ESG in private equity. Held at the China Club, more than 30 HKVCA members were in attendance. The panel discussion members included James Pearson, CEO of Pacific Risk Advisors, who presented a case study on ESG integration in practice. We would like to extend our thanks to James as well as to our other expert panellists: Doug Coulter, Partner, Head of Private Equity, Asia-Pacific at LGT Capital Partners; Jie Gong, Partner at Pantheon Ventures; Yi Li, Partner and Head of Business Development at Lunar Capital; Steven Okun, Director of Asia-Pacific Public Affairs at Kohlberg Kravis Roberts; and our moderator Darren Massara, Managing Partner at NewQuest Capital Partners. Our monthly breakfast meeting, held at the Hong Kong Club on Friday, 5 June, was again oversubscribed with more than 60 members in attendance. This successful monthly event would not have been possible without the one sponsorship of KPMG to whom we would like to extend our thanks for helping make this great networking event possible for our members. The 14th China Private Equity Summit, organized by the Hong Kong Venture Capital and Private Equity Association (“HKVCA”), took place on 1 June, 2015. Attracting more than 430 venture capital and private equity practitioners, leading corporations, and other industry professionals and participants from across the region, the summit discussion focused on the latest developments and trends in the private equity market in China. Held at the Hong Kong Convention and Exhibition Centre, distinguished guests at this one-day event included: Professor K C Chan, Secretary for Financial Services and the Treasury of Hong Kong SAR Government; Eric Mason, Managing Director, The Church Pension Fund; Joe Lee, Co-founder, KuaiDi Technology Co. Ltd.; and Shuang Chen, Executive Director & Chief Executive Officer, China Everbright Limited. The Summit explored a number of important and timely issues, including cross-border transactions; value creation in private equity investing; RMB funds; the “New Third Board”; China’s draft foreign investment law; the“One Belt, One Road” strategy; and the global ambitions of Chinese companies. Media Coverage can be viewed here. Photo Highlights can be viewed here. Video Highlights can be viewed here. The HKVCA’s always popular wine tasting event was held once again at the Hong Kong Club on 18 May. The theme of the evening was “Three Shades of Wine”and the event attracted close to 70 professionals from the private equity and venture capital industries. Special thanks to our sponsors Alter Domus and Clifford Chance. The highlight of the evening was our “Master of Wine”, Debra Meiburg, who took us through a journey of delicious French whites. As always the talk was both entertaining and instructive. Thanks also to our organizing committee and especially Anthony Chan, Alain Fontaine and Marcus Thompson for another very successful event. An HKVCA Luncheon talk, titled “Protecting Brand and Reputation During a Crisis”, was held on 11th May, 2015 at the China Club. Cara O’Brien, Senior Managing Director at FTI Consulting, delivered the talk, which included discussion of the importance of handling communications appropriately during times of crisis and insight on how to most effectively handle communications should a crisis actually occur. Thirty professionals representing the private equity and venture capital industries attended the event. On May 8, 2015, our always popular monthly breakfast meeting was held, attracting over 70 of dedicated HKVCA members. We are grateful to our members and guests who supported this great networking event, and express a special thanks to our sponsor, I-OnAsia. The 12th annual HKVCA Golf Day, on Friday, April 24, 2015, was a huge success with 66 enthusiastic golfers, a record number, teeing off in 18 flights under blue skies and warm sunshine. Under the sunny day, players were able to enjoy a great lunch after completing their rounds. We would like to thank our generous sponsors, namely Platinum Sponsors Citi and Morgan Stanley; Gold Sponsors Ernst & Young, UBS, Lexington Partners and Debevoise & Plimpton; Breakfast Sponsor Aon and Wine Sponsor BlackPine. We would also like to thank the Golf Committee and everyone who participated for contributing to the sucfchg.cess of this popular annual event. And don’t forget to save the date for next year’s Golf Day on Friday, 4 March, 2016! Another of our popular brownbag luncheon talks was held on April 21, 2015 on the topic of doing private equity deals in Indonesia. Held at the offices of Ashurst, who also generously sponsored the event, more than 50 HKVCA members were in attendance. We would like to extend our thanks to Ashurst as well as to our expert speakers: Atik Susanto from Oentoeng Suria; and Chin Yeoh, Dean Moroz and Joel Hogarth from Ashurst. Our Young Professional Mixer was held on April 16, 2015 at the Havana Bar in Lan Kwai Fong. This regular networking event, which is aimed specifically at our younger professionals, attracted over 60 participants from the private equity and venture capital industries. A brownbag luncheon talk, titled “New Rules on Indirect Transfers of Assets: How it may impact PE/VC Business”, was delivered by Dr Danny Po, Asia-Pacific and China National M&A Tax Leader, and William Lee, Tax Director, from Deloitte China. Held on April 13, 2015, the talk was both supported by and held at the offices of accounting firm Deloitte. Close to 30 members were in attendance. Among the specific issues that were discussed was the applicable scope of the bulletin and the reporting obligations on transaction parties. The talk closed with an illustrative discussion of specific relevant case studies. On Apr 10, 2015, our always popular monthly breakfast meeting was held, attracting close to 50 of our dedicated HKVCA members. We are grateful to our members and guests who supported this great networking event, and express a special thanks to our sponsor, FTI Consulting. An HKVCA Luncheon talk, titled “Mezzanine in China- In search of yield in an imperfect world”, was held on 30th March, 2015 at the China Club . Yonghong Sun, Managing Director, and Ince Pan, Director of Hony Capital, together delivered the talk, which included discussion of the latest trends and opportunities in mezzanine financing in China and construction of return and security packages, both in onshore and offshore markets. Sixty professionals representing the private equity and venture capital industries attended the successful event. The second annual Hong Kong Venture Capital Forum (HKVCF), organized by the Hong Kong Venture Capital and Private Equity Association (HKVCA), was held on Friday, March 13, 2015. 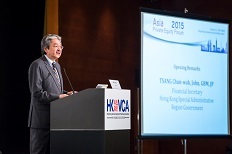 Hosted at KPMG’s splendid conference rooms at Hysan Place, the Forum proved to be an overwhelming success with more than 200 industry professionals in attendance at the jam-packed half-day event. The theme of this year’s Forum was “Future Technologies and Hong Kong” and the event featured a series of three expert panels discussing the impact and increasingly important role that both Hong Kong and the Mainland play as promoters and creators of innovation in the fin-tech, med-tech and internet of things (IoT) ecosystems. The Forum was opened by the Hon. 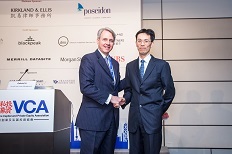 Gregory KL So, Secretary for Commerce and Economic Development for the Hong Kong SAR Government. Following the keynote address by Jun Wang, Managing Partner at Fosun Kinzon Capital, a lively panel discussion was held on the specific opportunities for growth within fin-tech. The panel consisted of Lawrence Chu, Co-founder and Managing Director, BlackPine Zheng He Capital Management; Melissa Guzy, Managing Partner, Arbor Ventures; Chris Dark, President International, C2FO; Zhengyu Wang, PhD, Founder and CEO, China Rapid Finance; Barry Freeman, Co-founder and CFO, Jimubox; and Simon Loong, CEO, Welab. The second panel featured a discussion on the latest investment trends in medical technology and featured a host of well-known sector experts: Andrew Teoh, Founding Partner, Ameba Capital; Jeremy Fearnley, Head of M&A, KPMG Corporate Finance; Judith Li, Principal, Lilly Asia Ventures; Paul Berriman, Group Chief Technology Officer, PCCW-HKT, and Nisa Leung, Managing Partner, Qiming Ventures. Much of the panel’s discussion centered around the importance of the Mainland market, both as consumers of med-tech and, increasingly, as technology innovators. The final panel of the afternoon was on the IoT and featured a lively discussion by panel members James Savage, Partner, Venture Investment Team, Headland Capital Partners; Steve Monaghan, Regional Director, Head of Edge, AIA; Rocky Lee, Asia Managing Partner and Head of Greater China Corporate Practice, Cadwalader, Wickersham & Taft; Marcin Dudar, Chief Technology Officer, Creedon Technologies; Tony Kwan, Director, Intel Capital; and Julie Ke, Vice President, Sequoia Capital China. Among the issues the panel pursued was a discussion on which devices would prove to be key in supporting the proliferation of the IoT and what technical and regulatory hurdles likely stood in the way of the sector’s evolution. The mini “Demo-Day” session that was held immediately after the panel discussions was followed with great interest by Forum participants, with excellent presentations from a variety of local start-ups. The Forum ended with a reception hosted by our sponsor KPMG and allowed all participants - investors, advisors and entrepreneurs – and invaluable opportunity for networking. The HKVCA would like to thank our panelists for their tremendous contribution to this year’s event. We would also like to extend our heartfelt appreciation to our sponsors - KPMG, Cadwalader and the Poseidon Group – who helped make the HKVCF a resounding success. Our monthly breakfast meeting was held on 6th March, 2015 and was attended by close to 50 of our dedicated HKVCA members. This successful monthly event would not have been possible without sponsorship from Poseidon. We would like to take this opportunity to again thank Poseidon for their continuing support. 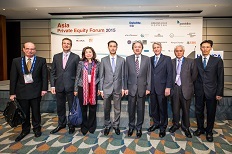 The 5th Asia Private Equity Forum (APEF), organized by the Hong Kong Venture Capital and Private Equity Association (HKVCA), was held on 21st January 2015 at the Hong Kong Convention and Exhibition Centre. This one-day event featured 64 speakers and panelists representing general partners, limited partners and advisors, and attracted over 550 delegates, of which more than half were senior level and C-suite executives. Distinguished guests at this annual flagship event included: Tsang Chun-wah, John, GBM, JP, Financial Secretary, the Government of the Hong Kong SAR; Gabriel Li, Managing Partner & Investment Committee Member of Orchid Asia Group Management; H. Chin Chou, Managing Director, Morgan Stanley; and Christoph Rubeli, Partner & Co-Chief Executive Officer, Partners Group. Leading industry practitioners addressed the most relevant topics currently facing the private equity industry and investors in many of Asia’s leading private markets, including China, India, Southeast Asia, Japan and Korea. Among the issues discussed were value creation strategies, the latest real estate market trends in Asia, fundraising, investor relations and challenges in exits and liquidity. 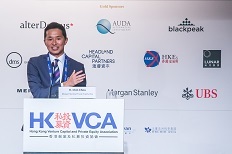 Conrad Tsang, Chairman of the HKVCA, said: “The HKVCA is again delighted to have collaborated with the Hong Kong Government in Asia Financial Week and to provide at the Asia Private Equity Forum a venue for in-depth discussion and analysis of the increasing quantity and quality of private equity investment activity in this region”. David Pierce, Chairman of APEF, said: “We have been fortunate to secure a formidably talented and experienced group of more than 60 speakers and panelists addressing the broad scope of private market investing in Asia, making APEF 2015 one of the most content-rich events of its kind anywhere”. 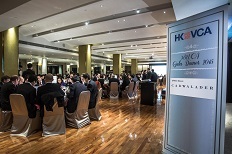 The HKVCA’s 2015 Gala Dinner was on Tuesday 20 January. A sell-out event saw more than 180 people sit down together to enjoy an evening of good food and friend-ship in the magnificent Hong Kong Country Club. Table decorations included sheep figurines as symbols of the upcoming Chinese New Year, and a multi-course French banquet was served to honored guests. Entertainment was the key spotlight of the night: a harp performance by 18 children from the disadvantage families was certainly unforgettable and meaningful. The evening also featured a presentation highlighting the HKVCA’s 2014 activities and achievements. On Jan 9, 2015, the always popular monthly breakfast meeting was again attracting 70 members in attendance. Thanks to all members and guests who supported this great networking event, and a special thanks to our sponsor FTI Consulting.